Pictured: Digga's PD4 Auger Drive Unit with Swing Control. As time passes and cultures evolve, many arts once regarded as vital, have sadly become obsolete. Unfortunately, Australia hasn't been immune to this either. Although we are a relatively young nation, truly blessed in so many ways, the challenges we've faced as a result of the global economic situation have taken their toll on some iconic Australian brands. Manufacturing is fast becoming a lost art in this country as we import more and more cheap goods from various foreign economies. Big business are slashing jobs, cutting costs and shipping our jobs offshore to improve their profitability. Like you and I, a company always measures its successes based on its values. When you know what matters to you, you can strive for that outcome. If you succeed in achieving it, you know the strategy you chose was the right one. What if a company had the vision to take the bottom line out of the equation just for a moment, then identify what breeds success and work backwards from there? Surely if you'd succeeded at delivering the premium product line, created the happiest employees, supported the most satisfied customers, and promoted honesty in your marketing strategy – the financial success of the business would take care of itself. Well, Suzie Wright and her team at Digga Australia have done exactly that. With their headquarters located right here in Australia, Digga is a global leader in the manufacture of earthmoving equipment attachments including auger drives, amongst other products. Having toured Digga's Queensland operation located in Yatala (30 minutes south of Brisbane), I can attest to the significant investment Digga has made to ensure the quality of its product line. 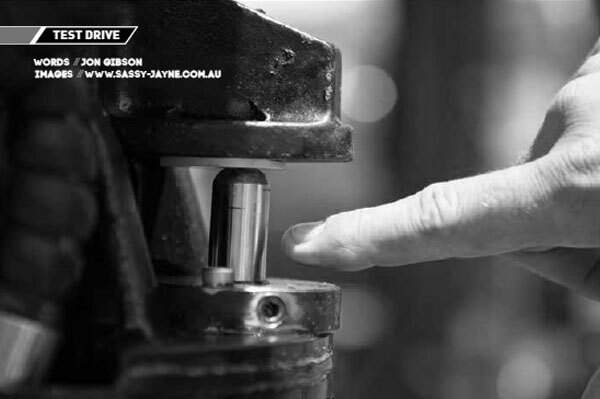 Digga’s modern, spacious facility employs approximately 200 people and houses numerous machining stations utilising CNC technology to ensure the finest tolerances are achieved. Even the gear sets from the planetary reduction assemblies are cut on site and heat treated to Digga specifications, right here in Queensland. Checks are made and measurements taken at every step to ensure the overall quality of the Digga product remains uncompromised. EERM recently tested a new Digga PD4 auger drive with Digga's own ‘swing control’ technology. As predicted, the unit performed flawlessly and the swing control unit left me wondering why it’s not compulsory on all jobsites. Swing control eliminates sideways swing while the auger is hanging in the air, while still allowing it to hang true as required. The torque achieved via the planetary reduction box was demonstrated in virgin ground with a 450mm auger, cutting its way into the ground at an impressive rate. The auger tools themselves were easy to remove and replace as required. If Australian manufacturing is to survive, and we intend to compete with the cheaper imported products, the remaining players need to take stock of what Digga has achieved. Digga also manufactures buckets, brooms, power rakes, pallet forks, slashers, trenching attachments and much more. For more information on Digga’s premium product line, call 1300 2 DIGGA.